The town of Hvar is the largest settlement on the island of Hvar in Croatian Adriatic. It is situated on the south-western coast of the island, in the cove protected by Pakleni Islands (Pakleni otoci in Croatian). The ancient name for the whole island and the town of Stari Grad, comes from the Greek name Pharos. Hvar became an island’s center in 13th century. The town’s harbor, protected by Pakleni Islands. The town of Hvar is the center of the island’s tourism, one of the favorite destinations in Croatia and one of the most prominent and visited tourist centers on the whole Adriatic coast. The main attractions are: pleasant climate, a lot of sunshine, natural beauties, various accommodation facilities, gastronomic offer, sports and recreational opportunities, active nightlife…. Restaurants and taverns offer excellent fish specialties, with exquisite local wines. 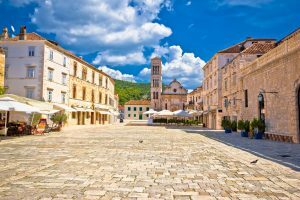 Hvar is the town with rich cultural and historical heritage among which stands the Cathedral of St. Stephan, the Franciscan monastery, Hvar town loggia, the Hektorovic Palace, the arsenal and the theater. The town also has many galleries, museums and exhibitions. 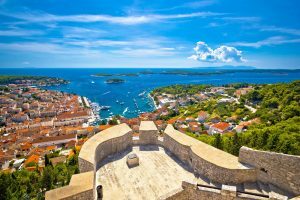 Hvar gained glory and power during middle ages being an important port within the Venetian, naval empire. The Roman settlement was located near the port (3rd c. BC) and the late antique at the foot of the hill, where the construction of town ramparts started after 1278. The center of the old part of the town was formed in the 15th century. On the northern slope above the square, within the town ramparts are partly preserved palaces of the Hvar aristocracy. Today Hvar is an important tourist resort with a centuries-old tradition in tourism. You will find crystal clear sea with rocky and small gravel beaches in Hvar, and the most beautiful ones are on the Pakleni islands. Jerolim – a well-known and long-established naturist beach equipped with showers, restaurant and a store. Zdrilca – a woody cove on the Pakleni islands with several pebble beaches, many hidden spots for relaxation, with a few restaurants. Stipanska – naturist beach equipped with showers, restaurant and a small shop. Palmizana – an extensive cove with a shallow beach. It is surrounded with dense pine woods, bushes of scented heather and rosemary, and different exotic plants. Mekicevica – only 2.5 km east of the center of town, it consists of two pebble beaches.